Uganda has attracted much attention and political visibility for its significant economic recovery after a catastrophic decline. 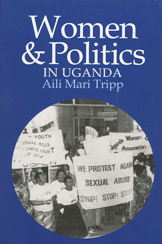 In her groundbreaking book, Aili Mari Tripp provides extensive data and analysis of patterns of political behavior and institutions by focusing on the unique success of indigenous women's organizations. Tripp explores why the women's movement grew so dramatically in such a short time after the National Resistant Movement took over in 1986. Unlike many African countries where organizations and institutions are controlled by a ruling party or regime, the Ugandan women's movement gained its momentum by remaining autonomous. Aili Mari Tripp is associate professor of political science and women's studies at the University of WisconsinMadison. The cloth edition ISBN 978-0-299-16480-5 is out of print.